94 Commercial Real Estate & Properties in North Lakes are listed in 5 categories. We have 61 OfficesLease , 17 Retail ShopsLease , 15 Industrial Warehouses Lease , 11 Medical and Consulting PropertiesLease and 11 ShowroomsLease . Ray White Commercial Northern Corridor Group are pleased to offeroffice suites at 5 7 Discovery Drive, North Lakes. This newly renovated and refurbished first floor office space offers high quality corporate style office suites with high quality finishes. Features: Various Tenancies from 66m2 to 108m2 Lift Access (Elevator) Motivated Owner (Incentives on offer) Generous onsite parking Ducted air conditioning Bike Rack Onsite Amenities with Showers Signage opportunities Larger tenancies available Prominent Discovery Drive location in the heart of the North Lakes CBD Minutes from Westfield North Lakes, IKEA, COSTCO, Public Transport The owner is offering competitively priced rent and generous incentives (fit out contribution or rent free). Please enquire now to find out more. For more information or to arrange an inspection, please contact Peter Laurent or Aaron Canavan from Ray White Commercial Northern Corridor Group. Ray White Commercial Northern Corridor Group is pleased to offer 1/110 Flinders Parade, North Lakes for Lease. 682m2 Retail Showroom fronting Flinders Parade Flexible zoning options covering retail, showroom and service industry 34 on site car parks Tailored fitout options available Located in the sought after North Lakes Business Park with major surrounding tenants including Bunnings, Costco, Westfield and many more. Please contact agents Aaron Canavan or Chris Massie for more information or to book an inspection. 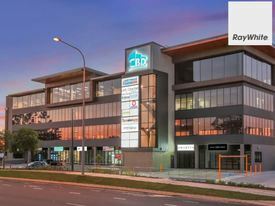 Ray White Commercial Northern Corridor is pleased to offer Suite 2B/2 Flinders Parade North Lakes for lease. Located in the heart of North Lakes this professional office suite is only minutes from Westfield North Lakes, IKEA, Costco, New North Lakes Medical Precinct has quick and easy access to Bruce Highway. Features: 137m2 Office/Medical Consultation Space 4x Individual Office Spaces + 1x Private Room Large Reception with Waiting Area Kitchen 5x Exclusive On Site Car Parks Secure Basement Parking On Site Cafe Ducted Air Conditioning Throughout Attractive Glass Frontage Male Female Amenities On Site For further information or to book an inspection, please contact Aaron Canavan or Chris Massie. Ray White Commercial Northern Corridor Group is pleased to offer to the market for lease First Floor office space at 9 Discovery Drive, North Lakes. The property features three potential layouts for prospective tenants being: bull; 3x 96 sqm tenancies bull; 1 x 192 sqm tenancy 1 x96 sqm tenancy bull; 1 x 288 sqm tenancy The subject property is a highly functional office space as part of a centre with duel access to both Discovery Drive Gregor Street West. 96 sqm of space is available immediately with the remaining 192 sqm of space available in February 2019. Property features include: bull; Exposure to Discovery Drive Gregor Street West; bull; Quality office space on First Level with excellent natural light; bull; Excellent Signage Opportunities; bull; Highly competitive rent; bull; Low outgoings; bull; Ample staff customer parking; bull; Easy access to Discovery Drive, Anzac Avenue, North Lakes Medic Precinct, Westfield North Lakes Bruce Highway; bull; Owner wants to do a deal and will consider any reasonable commercial offers. For further information or to arrange an onsite inspection, please contact agents Peter Laurent or Aaron Canavan from Ray White Commercial Northern Corridor Group. Ray White Commercial Northern Corridor Group is pleased to offer to the market for lease First Floor office space at 9 Discovery Drive, North Lakes. The subject property is a highly functional office space as part of a centre with duel access to both Discovery Drive Gregor Street West. 96 sqm of space is available immediately. Property features include: bull; Exposure to Discovery Drive Gregor Street West; bull; Quality office space on First Level with excellent natural light; bull; Excellent Signage Opportunities; bull; Highly competitive rent; bull; Low outgoings; bull; Ample staff customer parking; bull; Easy access to Discovery Drive, Anzac Avenue, North Lakes Medic Precinct, Westfield North Lakes Bruce Highway; bull; Owner wants to do a deal and will consider any reasonable commercial offers. For more information or to arrange and inspection, please contact agent Peter Laurent. High Visibility Retail/food Location Contact Agent for Latest ..
Ray White Commercial Northern Corridor Group is pleased to offer 9/25 Discovery Drive, North Lakes for lease. Features: 20m2 of Serviced Office Space Air conditioned Available now Shared use of common area, toilets, meeting room, kitchenette with fridge microwave Signage opportunity All inclusive rent (includes use of WIFI, water electricity) Security alarm Ample on site parking Ideal for a small office user looking to move out of home For more information or to arrange an inspection, please contact Aaron Canavan or Chris Massie. Ray White Commercial Northern Corridor Group is please to offer 1642 Anzac Avenue, North Lakes for lease. Situated directly opposite Westfield North Lakes, the building is just 2 minutes from the Bruce Highway and has excellent access to the gateway motorway major transport routes, public transport other major retailers including Bunnings, Officeworks, IKEA Costco. FEATURES: bull; Brand new office retail opportunities bull; Size options from 75m2 to 150m2 bull; Fronts busy Anzac Avenue bull; Large basement car parking bull; Lift access bull; Ducted air conditioning bull; Close proximity to Westfield, Costco IKEA First Level Tenancies: T102 75m2 T103 75m2 Option to combine both. For more information please contact Aaron Canavan or Chris Massie. Ray White Commercial Northern Corridor Group is pleased to offer this modern 61 sqm property within the Evergreen Centre in Discovery Drive for sale. This modern commercial unit is available vacant possession and is provides a tenant a fantastic opportunity to secure one of the most reasonably priced units in the centre of North Lakes. Property features include: bull; 61m² tenancy bull; Central North Lakes location within walking distance the North Lakes Health Precinct, Westfield North Lakes, local cafes and retail. bull; Close to Public Transport bull; Across the road from North Lakes State College bull; Good Customer Car Parking For further information or to arrange an onsite inspection, please contact EXCLUSIVE agents Peter Laurent or Aaron Canavan from Ray White Commercial Northern Corridor Group.